In his historic run for the United States Presidency, Donald J. Trump faced YUGE opposition from the establishment of both parties, and unprecedented vitriol from the media. Despite the barrage of negative, unflattering media, Trump voters resoundingly elected him the 45th President of the United States. 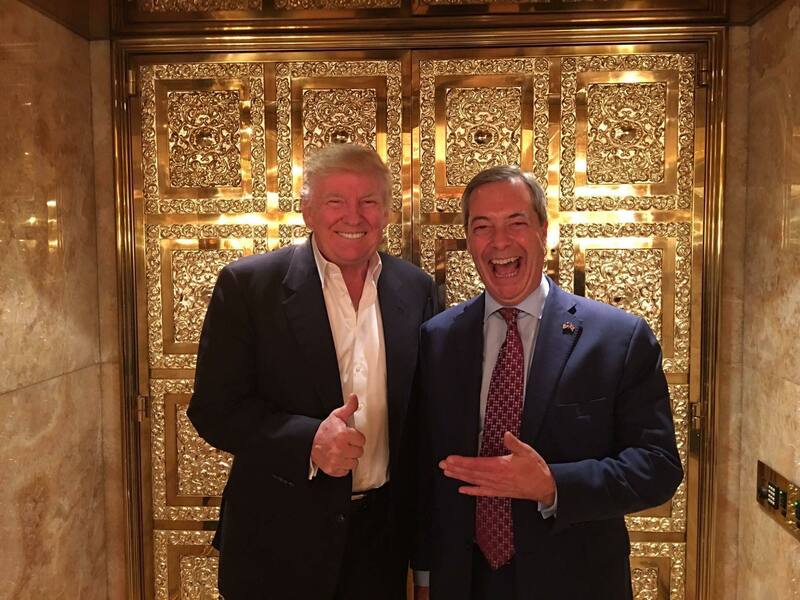 Trump’s victory was a needed repudiation of the political establishment, which has failed millions of working-class Americans who are suffering economically and continuing to fall behind. “The mainstream press, however, continues to exist in its own elitist bubble, blaming the messenger rather than absorbing the true message the voters have delivered,” Joseph Klein wrote for Frontpage Magazine. This believer in American Exceptionalism – something we have not seen since the days of Ronald Reagan — resonated with the people. 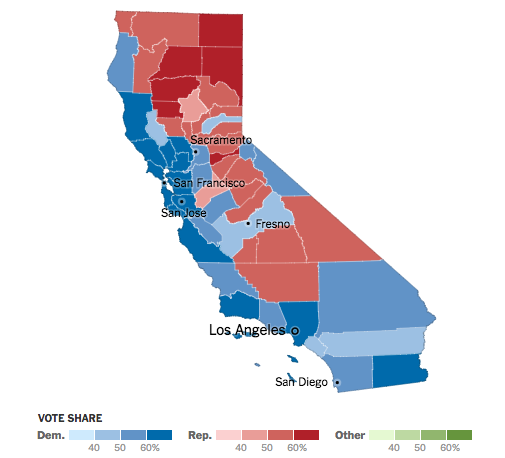 Trump won 26 of California’s 58 counties totaling 3,211,386 votes, to Clinton’s 6,000,586 votes. After campaigning for Hillary Clinton, California Gov. Jerry Brown weighed in on Trump’s victory, with a statement saying California won’t back down from the fight against climate change following Donald Trump’s election as president (because everyone knows climate change is the biggest threat we face…). Brown said Californians will “stay true to our basic principles” and will “protect the precious rights of our people.” Trump has frequently tweeted that climate change is a hoax, and has promised to roll back the Paris Climate Change Treaty. Many Democrats in California are worried Trump’s presidency could unravel California’s climate policies. The rest of us are elated. To do this, Trump appointed Myron Ebell of the Competitive Enterprise Institute to lead the EPA dismantling transition. Ebell questions global warming alarmism and opposes energy rationing policies. Ebell, the Director of the Center for Energy and Environment at CEI, should take pleasure in this assignment, given that in California, the fascist effort to kick poor and middle class people out of their cars by making it cost-prohibitive to drive, and suburban homes by rationing energy or making it cost prohibitive, is not working anyway. Go Ebell! With enough political support, the Trump administration could impose federal rules to override state climate change policies, and overrule most of California’s excessive and illegal climate change agenda. Gov. Jerry Brown has illegally signed independent agreements with others states and nations to form carbon trading markets and force arbitrary emissions limits. This could all come crashing down. “Trump’s triumph: California awakes to shocking new political landscape,” headlines across California shrieked. “The result is that the Democrat Party in the Golden State soon will be under siege by Republicans in Washington, D.C., said Democratic strategist Steve Maviglio,” the San Jose Mercury News reported. No… they never asked the legal, employed, working middle class citizens of the state how they feel burdened under the strange and draconian policies of Crazifornia. California is also home to the largest illegal alien population in the country, with 35 sanctuary cities. President-elect Trump has vowed to build a border wall and deport 3 to 11 million illegal and criminal aliens. The DACA program “currently protects nearly 800,000 young people — nearly half of them Californians,” CalMatters recently wrote, never acknowledging the illegality aspect. But as Breitbart exposed in August, it really puts illegal aliens on a fast track to permanent amnesty. This has been an economic disaster for California since Gov. Jerry Brown signed laws allowing illegal aliens to receive Obamacare, free tuition, drivers licenses and can vote in elections. Brown signed The California New Motor Voter Program which automatically registers all “eligible” California voters to vote when they first obtain or renew their driver’s licenses at the Department of Motor Vehicles. “Eligible” no longer means having the right to do or obtain something; satisfying the appropriate conditions. California has more than 38 million residents. Latinos now equal the number of non-Hispanic whites in California, despite net losses of millions of residents to other states. California continues to grow through mostly illegal immigration and their families. More than 33 percent of the nation’s welfare recipients are Californians, despite that California has just 12 percent of the nation’s population. Ergo: California is ranked number one in poverty. FYI: The Dow plummeted after Obama’s election – but hit new record high after Trump’s Election last week. As for education, Donald Trump has promised he would dismantle the U.S. Department of Education and send education planning and control back to the states. This is a very good thing for the country, but California’s declining public education system, already ranked 9th worst in the nation, will sink further into the abyss under total control of Jerry Brown leftists in this one-Party state. And when more parents pull their children from the public schools and home school or choose private schools, lawmakers will likely outlaw all school choice. During the campaign, Donald Trump vowed to “open up the water” in drought-stricken California, acknowledging that the “drought” is political. California’s drought conditions are actually historically normal. 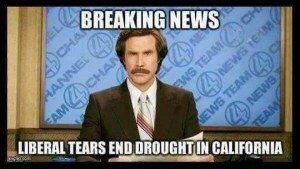 California’s current drought has been billed by government and media as the driest period in the state’s recorded rainfall history. Scientists who study the Western United States’ long-term climate patterns say California has been dry for significantly longer periods — more than 200 years. Trump knows it’s a government-created problem; if the State of California didn’t allow billions of gallons of fresh water to spill into the Pacific Ocean every year, we wouldn’t have a water shortage. The truth is that 50 percent of California’s water goes toward environmental purposes. Of the remaining 50 percent of the water, only about 10 percent goes to “urban” uses for homes and businesses, and 40 percent is used by agriculture. A full 50 percent of California’s water is used for environmental purposes. The water war in California is between radical environmentalists and the people. Most think that the Colorado River is the largest river, but the Sacramento River is about 60 percent larger. The problem is that, while officials store 70 million acre feet of water from the Colorado River, only 10 million acre feet of water is stored from the Sacramento River. The rest is lost into the Pacific Ocean. California’s population has increased has doubled since 1977 while water storage has not. 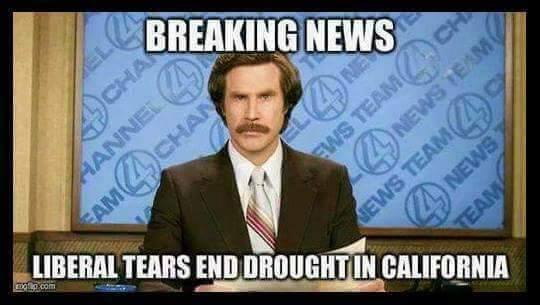 And lousy planning in the hands of environmentalists and government has left the state in dire need during this drought. I will keep you updated on the impact of the Trump presidency on California. Buckle up; we’re in for a ride!